I am a great fan of Russian aircraft, tanks and submarines, and also of Russian romantic classical music, from the likes of Rimsky-Korsakov, Borodin, Gliere, Glazunov, Kalinnikov and others. The love of the music came before the interest in the machinery (but influenced it), and they both exist together now. The Sukhoi family of fighters has always been a favorite of mine, though they were overshadowed by MiG for many years. 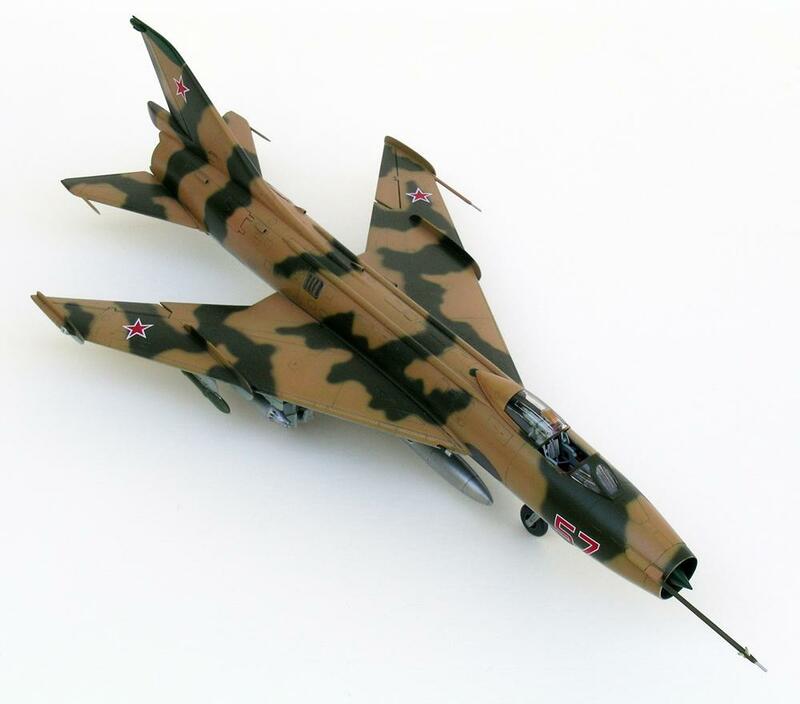 The Sukhoi Su-7 “Fitter” was the first major design success for Sukhoi, and has been compared to the Republic F-105 Thunderchief, though the Su-7 is a bit smaller. Both of them were designed by Russians, the Su-7 by Pavel Sukhoi, and the F-105 by Russian emigrant Alexander Kartveli. The Su-7 Fitter was the initial, fixed wing version of this aircraft, and it was later adapted successfully by Sukhoi into the Su-17 swing wing fighter, not a true totally variable geometry wing design, like the MiG-23/27, as it was just the outer wings that moved. Unlike in the US, Soviet aircraft design bureaus (OKBs) manufactured their own prototype aircraft, but they did not have production facilities. The Su-7 fixed wing production aircraft, and the Su-17 and beyond swing wing versions, were all manufactured at the appointed State aircraft factory, Plant No.126 at Komsomol’sk-na-Amure, on the River Amur, in the Soviet Far East. This Su-7 model is from an ESCI re boxing of the 1/48 Czech OEZ kit. It depicts a Soviet Air Force Su-7BKL aircraft (with the brake skids on the main gear) at the Krasnodar Training Center. The decals are from the Polish Hi-Decal Line on the Su-7. I chose this aircraft because of the interesting camouflage scheme. This is not the best kit (although it is really not that bad, you just don’t think Tamiya when you build these central europe kits-you are building them because that’s all there is of one of your favorites! ), but I think, in its various iterations with different kit makers, it still may be the only one in 1/48 scale. I did a bit of scratch build on the ejection seat, based on a resin one I’m saving for the 2nd kit I have (which is an OEZ), but other than that, it is pretty much as it came in the box. The complex main landing gear and many doors were a fussy item to put together. The main reference used was the Aerofax book “Sukhoi Su-7/-17/-20/-22” by Yefim Gordon. Other references were the Squadron In Action book by Hans-Heiri Stapfer on the “Fitter Family”, the Famous Russian Aircraft book on the “Fitter Family Su-7 / Su-17”, by Yefim Gordon and Dmitry Komissarov, and the Polish Stratus book on the “Su-7 & Su-20 in Polish Air Force service” by Dariusz Karnas. I also referred to the Czech 4+ book on the Su-17 – Su-22 swing wing Fitters for certain details. There are a lot of references for Sukhoi Fitters, but sometimes, even with many of them at hand, it seems like that one photo from that certain angle, to answer a question, can’t be found, and has to be interpolated from several sources. That’s one of the things that makes model building something that can really involve you! Not to mention frustrate! 7 additional images. Click to enlarge. Robert, you obviously have a passion for things, and this shows through into your models. The paint job is great, like your Saab, and the history makes a good read. I once saw the British comedian, Jimmy Edwards, perform Rimsky-Korsakov’s ‘Flight of the Bumblebee’ on the trombone, being a comedian, he changed the composer’s name to ‘rip her corsets off’…….. I bet that was something to see, especially on a trombone! Thanks for sharing the story, great British humor at work. Excellent build, Robert….paint, photography – nice work all ’round. Great build there Robert, not having built any post war Russian stuff yet it gives me some ideas. Great looking build. If you can make a kit that you consider OK look as good as this one I can’t wait to see one you do from a “Tamiya” like one. That’s a good looking jet there Robert, fantastic work. I love these aircraft too! 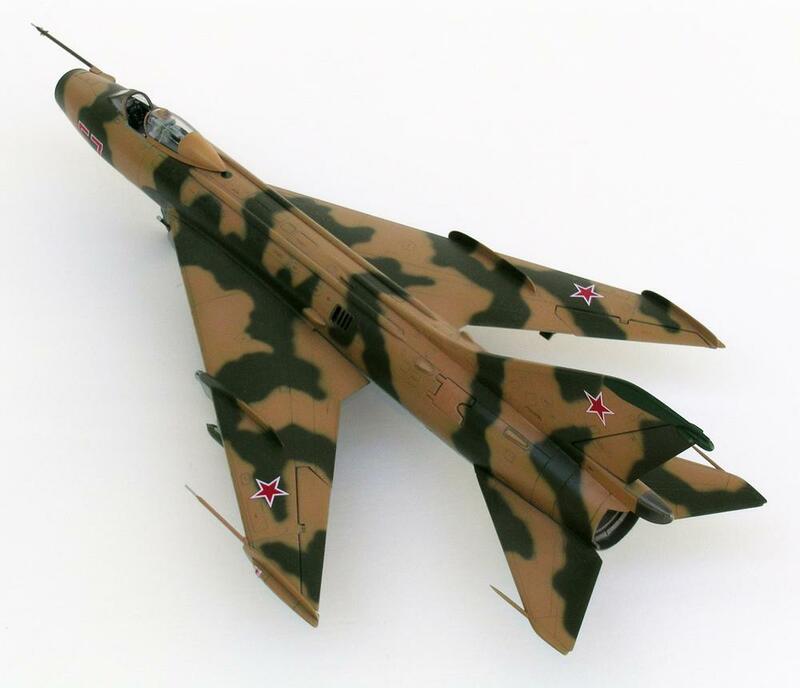 Have you seen the Trumpeter 1:32 SU-27 kit? I’ve promised myself a go when I have worked on my skills a bit. Have not seen the big Su-27 kit yet, but I’m guessing it would be too big for my model room! Good luck with it, I’m looking forward to seeing it on iModeler. Thanks. There is some cracking examples if you search for the kit on google images. I’ve got the same problem at present though, that build is a project to save till I have a bigger house! Very interesting background and your love for the jet shows in your build. Your patience to work through the problems the kit presented you with really paid off. Beautiful job, Robert. Makes me want to dig some Russian stuff out of the stash. Beautiful job on this and I loved the story. Beautiful work there! I love seeing models of aircraft we don’t encounter everyday. I worked with a Russian former-groundcrewman of Su-7s. He said “they were tough, very tough airplane!” I like this one a lot! Many thanks for sharing that. That was my understanding from all the research I did, looking at the various books. 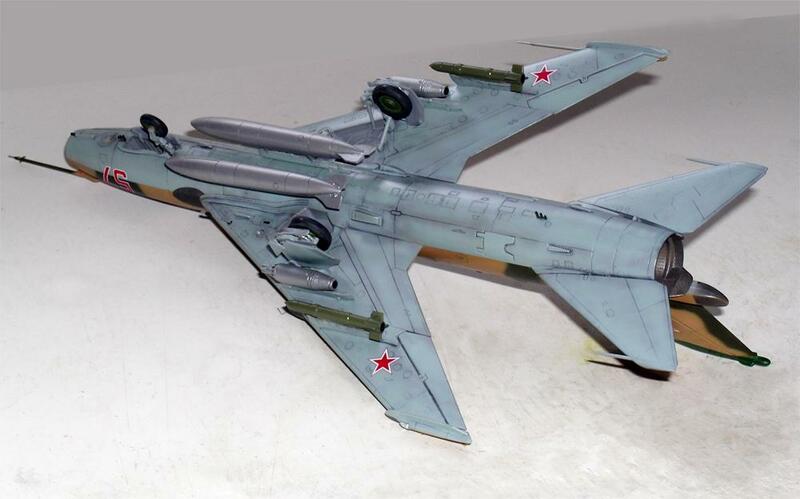 One thing I remember was what Yefim Gordon said in the Aerofax book, that the Su-7 “was a lot of aeroplane”. Very high quality model, looks just great! 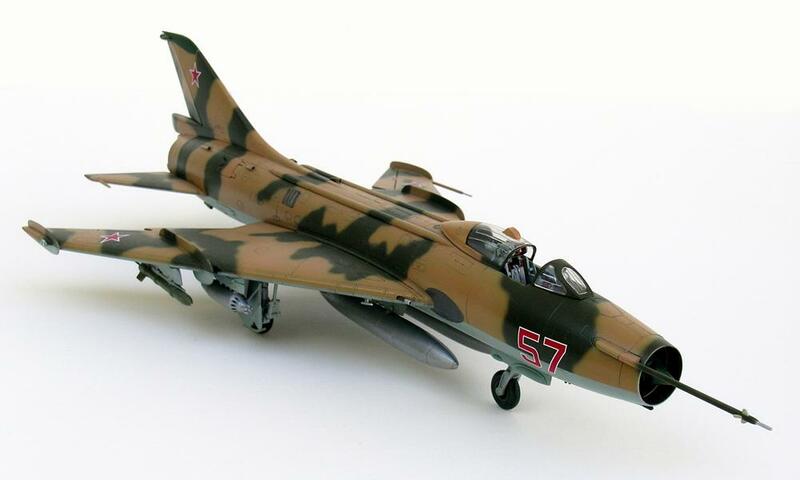 Many thanks to all for your favorable comments on the Su-7 model. I really appreciate them, and appreciate being able to participate in the wonderful iModeler site! I am really impressed with the way the site works so seamlessly and easily. Very well done. One of those aircraft that are more brutal than beautiful 🙂 ! I haven’t seen a -7 in real life but I have seen the -22 at Gatow museum outside Berlin. It is big but what is even more astonishing is the size and dimensions of the components: the hardpoints wouldn’t look out of place on a tank. At least not regarding size 🙂 ! Beautiful model, looking forward to more of them! Thanks for your comment, It goes along with what Gary Brantley says above, that it is a “very tough airplane”. And Yefim Gordon saying the Su-7 was “a lot of aeroplane”. I have always liked the rakish look it has, with the highly swept flying surfaces.